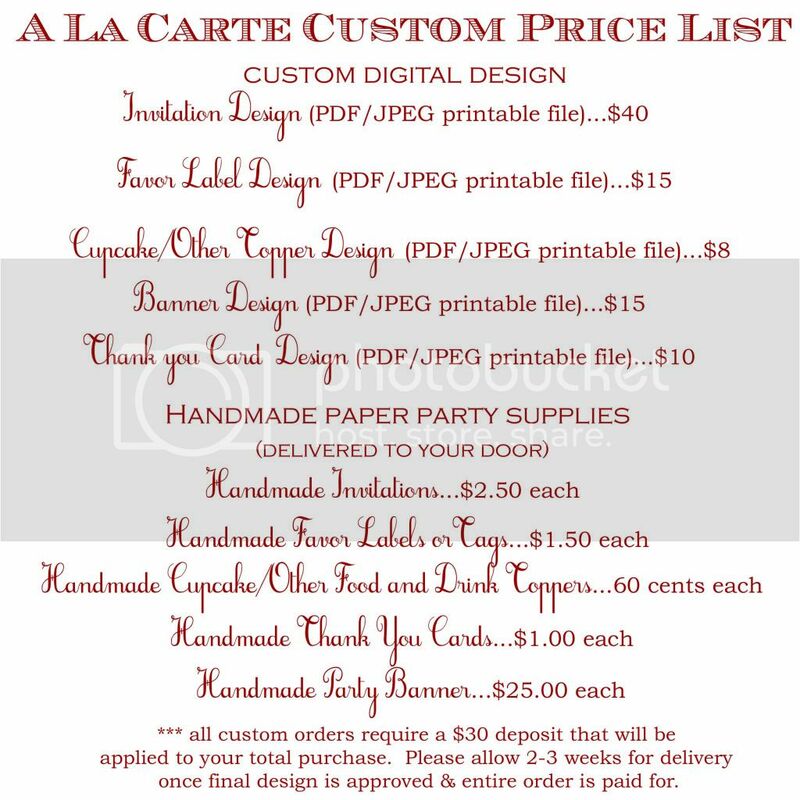 Juneberry Lane: Tutorial Tuesday: Cheap & Chic Glass Bud Vases . 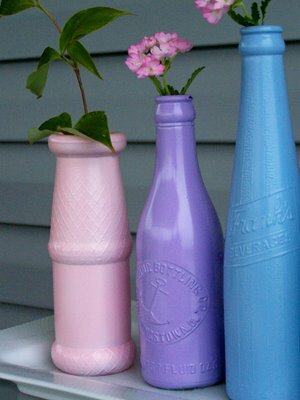 . .
Tutorial Tuesday: Cheap & Chic Glass Bud Vases . . . 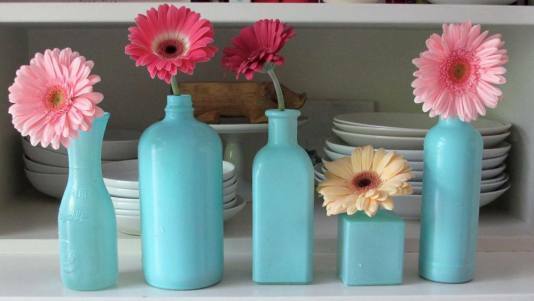 I have spent plenty of time searching for a pretty little assortment of vintage turquoise vases for the living room mantel and never can seem to find the amount that I want or the right color of blue. So imagine my delight when I came across this super simple project from Teresa Blackburn over at Relish; just the look I was going for at a fraction of the price & the perfect way to re-use those glass bottles I have leftover in the kitchen . . .
~ Various clean, empty bottles- any variety of bottles recycled from your kitchen will work, including dressing, olive oil, and vinegar bottles. 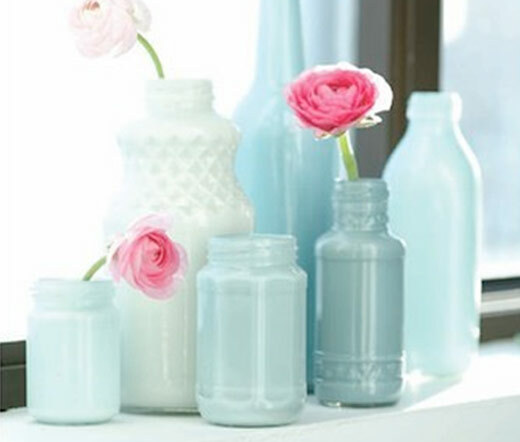 You can also do this project with a collection of canning or plastic jars. ~ 1 can robin’s egg Blue spray paint—I used Design Master’s paint which can be found at most large art and craft stores. 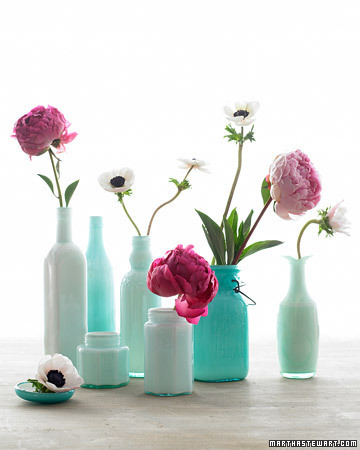 Be sure to choose paint with a “flat” finish to create a pretty glow when light hits the finished vases. 1. Place clean, dry bottles on spray surface. 2. Spray and layer color until bottles are evenly coated. 3. 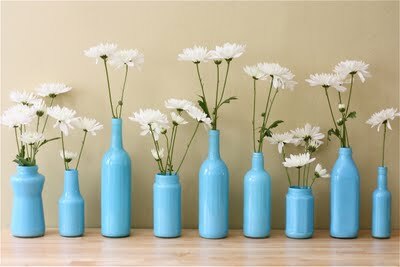 Let dry for at least an hour before using bottles as vases. 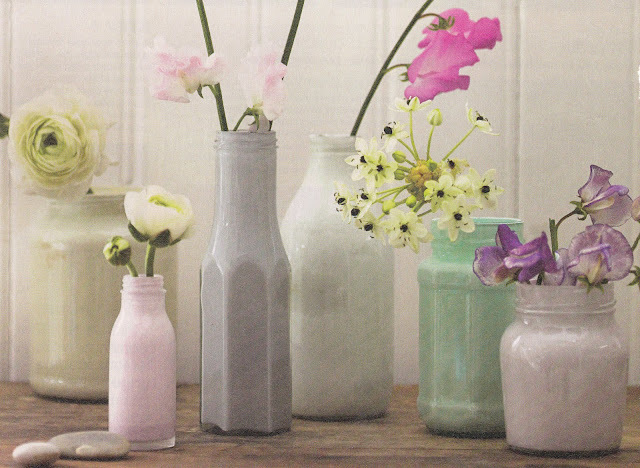 Fill each bottle carefully with water and place a blossom in each one. Line bottles up in a window, down a dining table, or on a shelf above the sink. To care for vases after painting, wipe carefully with a damp cloth. Do not put in dishwasher or in hot soapy water. And a bit more inspiration . . .
An assortment of these beauties would be a lovely & very budget-friendly centerpiece for the tables at your wedding or shower too...just picture the glass painted in white or whatever neutral tone you are leaning towards for your big event and the beautiful blooms bursting with color in your brightest hue! Now hit up that kitchen for your best glass bottles and whip up something delicious to use up that olive oil or salad dressing! !